Training your dog to sit is easy! Training your dog to sit is probably the best and easiest way to start teaching canine obedience. It is super easy to do, at leas the beginner level, then you can teach him to respond even with distractions. Because there are several steps to follow and each one is dependent upon the previous one, I divided this lesson into 3 Levels. When your dog graduates a certain level (I will tell you how to know this! ), then you and your pooch will be ready to move onto the next one. The idea is to introduce you to training with this command, you will see that dogs can learn something really quickly. However, it is very hard for them to then respond to that cue in any situation, this must be taught too. Level 1: Respond to the command even without treats. Level 2: Respond to the command in different places and with distractions even without treats. Level 3: Respond to the command and stay for several minutes, when the person walks away and even without treats. If you haven't done so please read: 1) "Marker Word: the first thing you should teach your dog! ", 2) "How to train a reliable dog command". Keep training sessions fun by using food treats, toys, games, petting and anything else your furry friend enjoys as rewards. You can train your pooch at any time! Use his/her dinner food to practice before your put the food bowl down. Ask him to do something before your throw a ball for him/her or play tug-of-war. If your pet is not doing what you asked him to do, it's not the dog's fault. Your canine friend is not stubborn or trying to get back at you! If your dog does not respond it is ALWAYS the trainer to be blamed. Read the troubleshooting section at the end or take a break. You do not have to complete every Training Your Dog To Sit Level. If you are happy with your dog at say...Level 1, then your are done! If you want more...keep going! It is up to you how much you want to train your furry friend. Never be afraid to go back down a level if you think your pet needs it. You will only have to do a quick review to refresh his memory and training will be more enjoyable. I organized Steps and Levels in a logical manner, but you can mix them up however you need to. This can be good to make training sessions fun! Be aware though that by combining different difficulty levels your puppy will initially have a poor response. This can easily and rapidly be fixed with....Practice practice practice! Always end your training session on a good note! Don't push your hound until you are both frustrated and tired. Short successful training sessions are the best! There are 3 Training Your Dog To Sit Levels. Each level has very specific goals which will be outlined in steps. In short, every time you add a new difficulty you have to reward your pet with food every single time. When he responds well (see Stimulus Control below), you cut down the treats to 50-70%. When you add another difficulty you bump-up the treats back to 100%...then cut them back down...and so on. Stimulus Control: When you say the command "sit" your pooch reliably sits. You have good stimulus control when your pet responds to a command correctly 8 out of 10 times you ask (or 4 out of 5). Because dogs do not learn as fast as humans, the stimulus control you get in a certain situation will not be the same in a different situation. This is because dogs are not good at generalizing! You will teach your hound to sit in different places, with different levels of distractions, etc. And each time you will "start from the beginning". Don't worry! Your dog will learn faster and faster the more you train him/her! 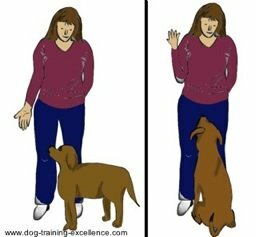 Stimulus Discrimination: This will be important when you start teaching your pet more commands (down, stand, bark, jump, etc). With more commands your canine friend not only has to respond to a command promptly, he has to respond with the correct behavior! You don't want him to sit when you said down! You have good stimulus discrimination when your dog responds with the correct behavior, on the first try, after your command 8 out of 10 times. Stimulus Discrimination: The dog only knows one command at this point. Difficulty: Your dog will respond to the command in 1 location with no distractions. No distance or duration (stay) is required at this point. Reward: You will mark the correct behavior every single time but only reward 50% of the time. Important note: while doing this exercise DO NOT say the word sit! We will teach this word to your pet once he is ready. He doesn't know the word yet and by saying it now you will only make it a weaker command! 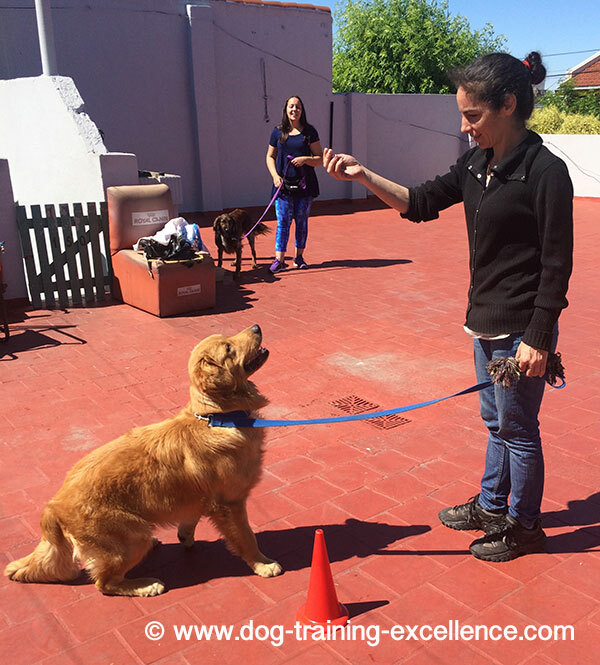 To start training your dog to sit, we will use the dog training method Luring. Put a piece of really good treat between your thumb and middle finger and show it to your pooch. Do not let the animal take the treat! Just let him sniff it and lick it. Now move your hand to the right, then to the left, then up or down. Is your dog following your hand? If he is, move the treat slowly up and backwards as if wanting to put the treat between his eyes. Your puppy will try to follow your hand and move his muzzle up, which in turn will make his bottom go down! If he sits in the process, Mark and Reward! Repeat up to 5 times until your furry friend starts doing it faster, almost anticipating that he has to sit to get the treat! Always give the treat in your hand after he sits (and while he is still sitting!). We will work on cutting down on the treats later on, when your puppy is ready. If your dog is sitting eagerly with a food lure, move on to the next step! Your dog is not following the treat in your hand? Try a different treat, something your pet will go crazy for! Try a toy. Then your best next option is to use the dog training method Capturing. Have treats near you and Mark and Reward! every time your canine friend sits on his own. This will take you a little longer because you have to wait for your hound to do it, but you will have less steps to follow and the behavior will be well trained! To get several sits in one training session, make your dog break the sit by calling him to some other part of the room. Then wait again...if he sits....yes! Mark and Reward! Your pet should start sitting more often during a training session. When your dog is eagerly sitting in front of you to get a treat, go to the cutting down treats step! We want your pooch to follow your hand even though you won't have a treat on it. Put the treat on your other hand and hide it behind your back, but "pretend" you still have a treat on your luring hand. Because your hand still smells like treat and your pooch is eagerly participating, do the hand movement and if he sits...Mark and Reward!!! Give him the treat with the hand that was behind your back, to make it clear now that you never had a treat in your luring hand in the first place. Repeat this exercise alternating between having the treat in your luring hand or on the other hand. Make it random, start by hiding the treat once every 3 times, then twice every 5 times, etc. If your pet fails to follow your empty hand, be patient, go back to luring with a treat but not more than 5 times. Wait for him to think and do the behavior. Take a short break (10 seconds) and lure with your empty hand again. When training your dog to sit, always give a treat to your puppy if he sits without you having food in your hand! When your dog is following your empty hand 80% of the time (8 out of 10 times) move on to the next step! Now it's time to have your puppy respond to your empty hand lure even if he doesn't get a treat afterwards! It's not like he won't get a treat ever again! We just want to teach him that sometimes there is no treat, but he needs to keep responding because other times there is! Lure your pet. When he is sitting down Mark! But don't give him a treat. Start by doing this only 1 out of 5 times. This way the animal is still eager because treats are plenty! But after some practice start shifting the ratio. 2 times no treat out of 5. Then 3 times no treat out of 10 and so on. You don't have to keep count, just do a rough estimate. 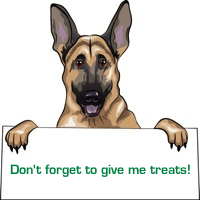 The idea is to randomly give treats to your pooch but keep them plenty! The goal is to get to a point when your dog will only be rewarded 7 out of 10 times but he still participates eagerly! Important note: make sure you give the rewards randomly! Do not just alternate one time yes, one time no...because your hound will learn to respond every other time. You want to give the treats in a way in which he cannot guess when it is coming and when it is not. This will keep him guessing and eagerly participating! Because we are still in level one, we want to reward often, keep the animal happy! Don't try to cut down the treats more than what I recommended! If you are using Capturing, do the same thing. Only reward 9 out of 10 sits, then 8 out of 10 sits and so on. Pick and choose the best dog sits! Since you are now only rewarding 7 out 10 times your puppy correctly responds to your sit command, use this to your advantage! When you choose not to give a treat, do it in those particular times in which the behavior was not the best. For example: if you lure your canine friend with your empty hand, but he takes more than 2 seconds to respond Mark! but don't reward with a treat. Another example: if your pet sits in a sloppy way, don't treat! Instead use the treats when the behavior is fast and neat! It's time to make that Lure look like a hand signal or teach your dog a hand signal if you are using Capturing. The most common hand signal for "sit" is to move your hand from your thigh to your shoulder, starting with your palm facing up. This resembles the actual lure movement! Change the lure movement slightly to make it look like what I described above. If he sits, Mark and Reward! If he doesn't sit, be patient. Give him time to think about the situation. He will most likely sit because this behavior has often given him a reward so it's always worth trying! Count to 10 in your head before you do the hand signal again! Even though your were rewarding 70% of the time in the previous step, now you need to go back to 100%! Your hound needs to learn that responding to the actual hand signal pays! So, don't cut back on treats just yet! When your dog is responding to your hand signal 8 out 10 times you ask, you are ready to move on! Do the hand signal and wait for him to stand. Wait....be patient. When your pet sits....Mark and Reward! Give him a treat reward for every response that happens after your hand signal. Ignore any sits that happen without you doing the hand signal. Your hand signal now acts as a "green light" for your pooch to do the behavior and get a treat for it! You are ready to move on to Step 5 when your dog responds to your hand signal 8 out of 10 times (or 4 out of 5). Step 5: Cutting down on treats...again! Repeat the steps outlined above to cut back on treats! You will notice that every time you add a new difficulty to the training, you treat 100% of the time....then back down to 70%....then go up to 100% when adding another difficulty....etc. You will be doing this with every dog training command you teach your furry friend! Let's turn that hand signal into a verbal command! A behavior will happen more often if it is being rewarded. And your command should act as the "green light" for your pet to do the behavior and get rewarded. Important: you will go back to giving treats for every single correct response! First clearly say the verbal cue "sit". Immediately after do the hand signal. Mark and Reward! your dog's correct response. If he doesn't respond to your verbal command be patient and repeat steps 1-4 again until successful. Sometimes you just need to give the animal some time to think too! Ignore your puppy if he sits but you did not say the command! Your pet should be siting often during a training session and you should be rewarding him/her only 7 out of 10 times he sits. Clearly say your command "sit". Mark and Reward! your dog's next response. Repeat steps 3-6 until your pooch is only responding after you say the obedience command. When your dog is responding to your verbal command 8 out of 10 times you ask...move on to the next step! It's time to cut back on the treats again! Follow the instructions given above but this time cut treats down to about 50-60%. This means that you will only give your puppy treats 5 out of 10 times he responds correctly. We only cut down treats in half after the behavior is well established. And remember when you add a new difficulty you need to give treats every time again! Always give your dog verbal praise using your Marker Word! Will you need to use treats always? Let me ask you this, do you like to get a paycheck every month? Your dog feels the same way! If you want him to reliably respond to your commands keep rewarding them. Because you will be doing it only half of the time and randomly, your canine friend will ALSO respond when you do not have treats! 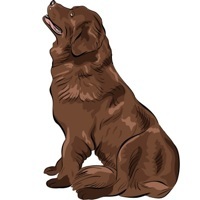 You are ready to move on when your dog responds 8 out 10 times to both hand signals or verbal commands and is being rewarded 50-60% of the time. Use this time to further refine the behavior. Give treats for faster responses as well as neat postures. Training your dog to sit should be fun for both you and your pet! Congratulations on training your dog to sit at Level 1! This is the hardest level of all! From now on it should go faster because both you and your furry friend know the rules of the game a little better. He/she sits 8 out of ten times you give a hand signal or verbal command. Your puppy can only do this in 1 location (where you have been training). You can now move on to the next level or start training your dog to lay down at the same time you continue with sit level 2. Continue to Training your dog to sit Level 2. Training your dog to sit can be very useful. For example: you can use this command to prevent your pet from jumping on people! This happens often and I can give you two solutions. First, try not to lean over your puppy's head as if "towering over" him/her. Most dogs will feel threatened by this and will instinctively move away from you. Instead keep your body upright and only move your hand over your pet's head. Second, position the animal with its back a few steps from a wall. If he backs up, he will hit the wall and might have no other option but to sit instead. My dog does not like to sit! He is a Greyhound! Some dogs, like Greyhounds, do not like to be in a sitting position. It is actually uncomfortable for them. You have two options. 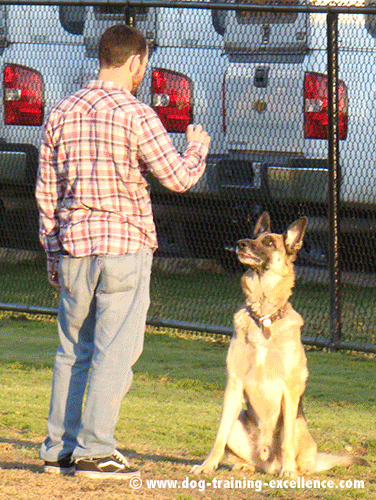 Number one, do not force your pooch to respond to a command sit, teach him down instead. Number two, try using the dog training method Shaping to get your dog to sit. Learn how to use Shaping here!